Israeli aircraft killed 10 people and injured nearly 100 others in five waves of air strikes in Gaza yesterday. The heaviest attacks came after nightfall, when helicopters targeted a car in the Nusseirat refugee camp in central Gaza, killing seven people and wounding 75, witnesses and Palestinian officials said. Residents said that Israeli helicopters fired three missiles at the main street, destroying a car. An Israeli army statement said the vehicle was carrying members of a Palestinian terror squad fleeing after a failed attempt to breach the border fence with Israel a few miles to the north-east. Witnesses said one of the dead was a doctor treating victims when a second missile struck. The identity of the other victims was not immediately known. Israel's Channel 10 TV said that none of the dead were militants, calling the refugee camp strike a "mistake". The first of the targets yesterday was a half-built house in a Gaza City suburb, which was allegedly being used to produce Qassam rockets. The Israelis then hit a car driven by two Hamas members who had salvaged equipment from the bombed house. The two militants were killed along with a passerby. Four children who had left a nearby school were injured. A house and a second car were hit in a third strike. An Israeli army spokesman said the two houses were used to store and produce weapons and that the car was being driven by Khaled Said Matzri, a 35-year-old Hamas member. The refugee camp was the target of the fourth raid. The fifth attack reportedly hit one of the earlier targets. Ra'anan Gissin, an adviser to the Israeli prime minister, Ariel Sharon, had earlier declared that the strikes were part of Israel's war on terror. "We will chase the terrorists everywhere. They will have no sanctuary," he said. Mr Sharon told parliament yesterday: "The Israeli military will continue to act to foil terror attacks, capture murderers and liquidate terror organisations." He also claimed that Israel was still committed to the American-sponsored roadmap to peace, but renewed a threat to remove the Palestinian Authority leader, Yasser Arafat, from the political scene. "This man is the greatest obstacle to peace," Mr Sharon said. "Therefore, Israel decided to bring about [Arafat's] removal from the political arena." The renewed threat contradicts comments that Mr Sharon made last week, when he said that removing Mr Arafat would be against Israeli interests. 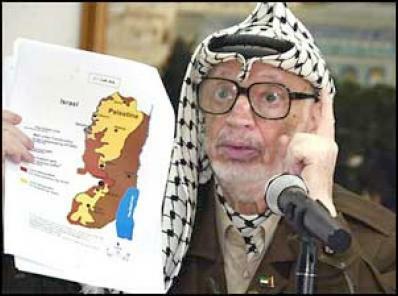 The Palestinian prime minister, Ahmed Qureia - better known as Abu Ala - condemned the strikes. He said: "These Israeli acts do not help ceasefire talks, they discourage them ... This is part of the permanent Israeli aggression against the Palestinians. "We want the Israeli government to sit down with us and negotiate a ceasefire," he said, adding: "The world should wake up to this aggression." The militant groups Hamas and Islamic Jihad threatened revenge for the strikes. The raids were prompted by the firing of eight Qassam rockets at Israeli targets on Sunday. 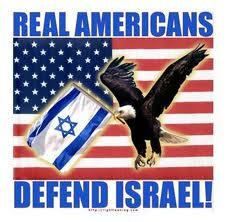 Israel views the missiles as a strategic threat, regardless of their impact. Also on Sunday, three Israeli soldiers were killed and a fourth seriously injured when they were ambushed on a foot patrol near Ramallah. In the first assault yesterday, Israeli jets blew up a house belonging to Amar Mushtaha, an activist in the Hamas military wing. He was slightly wounded, but was rescued from the destroyed building. The building was near the home of a senior Islamic Jihad official, Abdullah Shami, who was unharmed. The Israeli army said Mr Shami was not the target of the attack. "I want to thank God for the survival of Sheikh Abdullah Shami, and I assure you that he is OK," an Islamic Jihad spokesman, Khaled Batch, said at the scene. Rawda al-Jamal, a witness whose children, aged two and three, were hurt in the attack, said: "It was like an earthquake, everything started to fall on us." Other witnesses saw two men, who must then have been tracked by Israeli intelligence, taking equipment from the rubble. Their pickup had stopped at a traffic light near a petrol station, on a busy street crowded with schoolchildren, when the missiles hit. 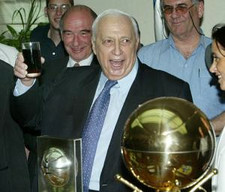 Ariel Sharon says he has abandoned a threat made by his cabinet barely a month ago to exile or even kill Yasser Arafat. The Israeli prime minister told the Jerusalem Post that attempting to deport the Palestinian president was not a realistic option. "Our calculations for years have been that expelling him would not be good for Israel," Mr Sharon said. "The likelihood of expelling him without harming him is low, not only because of his security guards, but because he would be surrounded by a human chain of Israelis. The opinion of our intelligence services is that expelling him would not be a good idea." Asked if that meant there could not be peace before Mr Arafat dies, he said: "I didn't say dead, but in my opinion, as long as he is in control, the chance for progress is nonexistent." The Post did not ask him why the threat to "remove" Mr Arafat had been made in the first place. But Mr Sharon's retreat will reinforce the growing perception among Israeli voters that the prime minister is floundering. Opinion polls show falling support for Mr Sharon and his militarist tactics. Asked about the family member of a victim of the recent Haifa suicide bomb who is demanding to know where Mr Sharon is leading Israel, he said: "There have been more difficult times." The United States last night vetoed a United Nations resolution demanding that Israel neither harm nor expel the Palestinian authority president, Yasser Arafat. The US veto flew in the face of the security council, which voted overwhelmingly in favour of the motion. Eleven members gave their backing and three, Britain, Germany and Bulgaria, abstained. The decision to exercise the veto sparked anger among the Palestinians. The authority's chief peace negotiator said he hoped Israel would not take the American action as a "licence to kill" Mr Arafat. Syria, the only Arab nation on the security council, tabled the resolution after last week's statement from Israel's security cabinet that it intended to "remove" Mr Arafat. John Negroponte, the US ambassador to the UN, said it did not support the assassination or forced exile of Mr Arafat. But it had vetoed the resolution because it failed to condemn groups such as Hamas, which it blames for promoting terrorism. "The Palestinian Authority must take action to remove the threat of terrorist groups," he said. The US said the wording of the resolution did not promote the "road map" to peace, which has been backed by the US, the UN and Europe. Discussions on the resolution have been taking place over two days. Almost all of the delegates condemned the comments by the Israelis regarding Mr Arafat. On Monday, Britain proposed a number of amendments that were rejected by Syria. Syria's UN ambassador, Fayssal Mekdad, expressed regret at the result of the vote, calling the resolution "highly balanced" and noting that most of the language came from previous resolutions adopted by the security council. "The fact that the US delegation used its veto is something extremely regrettable," he said. "It only complicates a situation in the Middle East that is already very complicated." Last Friday, the 15 council members - including the US - agreed on a press statement expressing "the view that the removal of chairman Arafat would be unhelpful and should not be implemented". Predictably, the UN vote and veto brought condemnation from each side. Nasser al-Kidwa, the Palestinian UN observer, said the US had lost its credibility to play an honest broker in the peace process. Ra'anan Gissin, senior adviser to Israeli prime minister Ariel Sharon, said the UN "has shown time and time again its duplicity and hypocrisy" with not a single resolution condemning the 120 suicide bombers in the last three years. The Israeli deputy prime minister, Ehud Olmert, admitted on Sunday that his government has not ruled out assassinating Yasser Arafat, the chairman of the Palestinian Authority. "His expulsion is an option, his liquidation is another option. It is also possible to confine him to prison-like conditions," he told Radio Israel. Haaretz, the left-leaning Israeli daily, said that the government's attitude toward Mr Arafat - there were also calls last week from within the cabinet for Mr Arafat to be exiled - was "sheer stupidity". The paper said: "Even if it is only arrogant boasting, the resulting damage is considerable. And if the talk is genuine, the results could be much worse." That view, however, was not shared by the Jerusalem Post. In a leader following Tuesday's suicide bombing in Jerusalem, which killed 15, it had called for Mr Arafat, as well as the leaders of Hamas and Islamic Jihad, to be killed. "We must kill [him], because the world leaves us no alternative," said the Post, which argued such killings would not radicalise the Arab world: "The current jihad against us is being fuelled by the perception that Israel is blocked from taking decisive action to defend itself." The Arab press said that was an incorrect assumption. "A move against Mr Arafat would lock all concerned in a blind alley. On one side would be Israeli violence backed by American diplomatic and financial muscle; on the other, legions of men willing to commit suicide so long as they take a few others with them," warned Lebanon's Daily Star. "In the middle would sit millions of innocent Palestinians ... And the people from across the Islamic world would have no choice but to follow the Israeli example and take off the proverbial gloves. The dreaded 'clash of civilisations' would be one lengthy step closer." Colin Powell, the US secretary of state, was quick to admonish the Israeli government. Washington supported neither the assassination nor exile of Mr Arafat, he said. But the Star was not convinced. "Previous 'advice' from President George Bush and his team has been blithely ignored by [Israel] ... Why should this instance be different?" it asked. That being the case, agreed the Riyadh Daily, the United Nations could no longer stand idly by. "The UN ... needs to step in forthwith to protect the Palestinian president. The long-felt need for an international force in the occupied lands has perhaps never been felt as much as now." The Israeli government is considering killing Yasser Arafat as one of the means to carry out its threat to "remove" him as an obstacle to peace, Israel's deputy prime minister, Ehud Olmert, said yesterday. The statement was immediately denounced by the Palestinian leadership, which said it was the thinking of the mafia, not a government. It also reinforced unusual questioning of the security strategy of the Israeli prime minister, Ariel Sharon, from within the country's political establishment, amid a growing belief that his insistence on a military solution to the conflict is costing Israeli lives. At the weekend, Shimon Peres, the former prime minister and present leader of the opposition Labour party, broke a long silence on criticising the government's security policies by warning Mr Sharon that the decision to "remove" Mr Arafat by exiling him, or any other method, would help the militant Islamist movement Hamas. "This government has destroyed the peace process," Mr Peres said on the 10th anniversary of the Oslo accords that won him a Nobel prize. Mr Olmert told Israel radio that the cabinet's decision to remove Mr Arafat could be viewed in the same manner as Mr Sharon's pledge to wipe out the leadership of Hamas. "Killing is definitely one of the options," he said. "We are trying to eliminate all the heads of terror, and Arafat is one of the heads of terror." The statement was immedi ately condemned by the Palestinian chief negotiator, Saeb Erekat. "This is the thinking of the mafia," he said. The Palestinian leadership has found unusual backing on the issue from within the Israeli political mainstream, which has until now shied away from drawing a link between Mr Sharon's security policies and terrorist attacks. But Labour's doubts turned to anger when Mr Sharon was seen to undermine a seven-week ceasefire by the continued killing of Hamas and Islamic Jihad leaders. The truce brought a lull in the suicide bombings, but the army's resumption of "targeted killings" provoked what the two groups said were retaliatory suicide bombings that left more than 30 people dead. The chairwoman of the Labour faction in parliament, Dalia Itzik, told a party meeting chaired by Mr Peres at the weekend that Mr Sharon was sacrificing Israeli lives. "The prime minister has failed completely and must resign." The leftwing Meretz party also condemned the threat to Mr Arafat as endangering Jewish lives and strengthening Hamas. "If you deport Arafat you leave the ground only for Hamas," it said. "That's not something the government is doing out of stupidity. It's a strategy to keep things as they are, to prevent the solution of two states." The mainstream press has been unusually critical, describing the move as evidence of a "bankrupt policy". The Arab League today said that Israel was declaring "war" on Middle East diplomacy by threatening to expel the Palestinian leader, Yasser Arafat. "I personally believe this is tantamount to a declaration of war on all efforts to return to a political process between the Palestinians and the Israelis," Hisham Youssef, the spokesman for the Cairo-based league, said. Mr Youssef called on the international community, particularly the US and the UN security council, to prevent Israel from carrying out its threats and to stop the situation from deteriorating further. "I believe that the implications of such a decision would be devastating, not only for the region but beyond," he told the Associated Press. On Thursday, Israel's security cabinet declared Mr Arafat "a complete obstacle" to peace following two Palestinian suicide bombings in which 15 Israelis were killed. The cabinet added: "Israel will work to remove this obstacle in the manner, at the time, and in the ways that will be decided on separately." The wording left open the options of deporting Mr Arafat, capturing him or killing him. In Washington, state department spokesman Richard Boucher said: "We think that it would not be helpful to expel [Mr Arafat], because it would just give him another stage to play on." 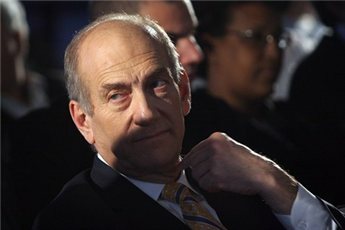 The US ambassador to Israel, Daniel Kurtzer, was to meet the Israeli defence minister, Shaul Mofaz, today. Mr Mofaz is reported to be pushing for Mr Arafat's expulsion. Israel Radio reported that Mr Kurtzer would relay stiff US opposition. Israel's threat was followed by an outpouring of Palestinian support for Mr Arafat, the embattled leader who has been trapped in his battered West Bank compound for more than a year. When asked whether the Arab League would assist in any bid to accommodate Mr Arafat if Israel expelled him, Mr Youssef said: "Of course as an Arab leader, he is welcome in any country, but this is not the task at hand. "The task now is to prevent Israel from implementing such outrageous decisions." In Jordan, the foreign minister, Marwan Muasher, denounced Israel's threats, saying that expelling Mr Arafat, who is the Palestinian people's elected president, would not serve the peace process. "Such a decision will push forcibly the whole Middle East into a dangerous tunnel," the official Petra news agency quoted him as saying. The king of Bahrain, Sheik Hamad bin Isa Al Khalifa, told the Bahrain news agency that Israel's threat to expel Mr Arafat "would be harmful to stability and a blow to the Middle East peace that all Arab countries are working hard for."